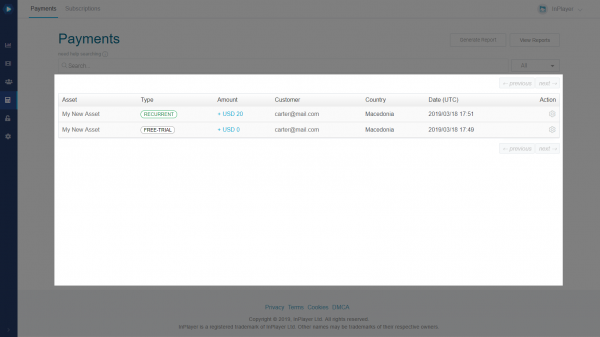 In the following guide, you will get more familiar with the Payments section of the InPlayer Dashboard. 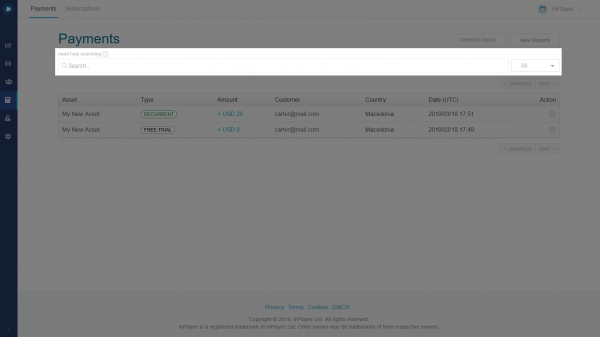 The payments section offers a live overview of each of your customers’ payments. 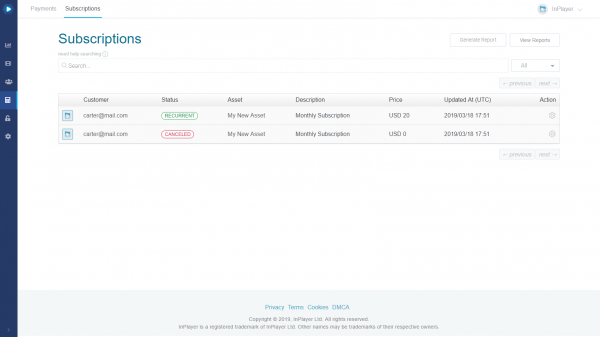 It has two tabs: Payments and Subscriptions. The Payments tab offers a complete overview of your customers’ payments. This includes both the ppv (one-time), and subscription (recurrent) payments. Below that, you have the search bar, along with the option to choose whether to view a list of All, Recurrent, Charge, or Refund payments. 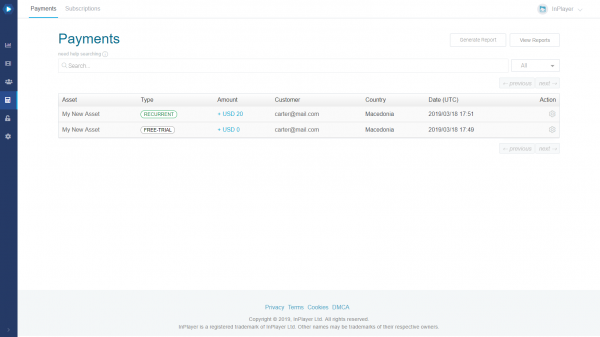 Recurrent – displays only subscription payments. Charge – displays only ppv (one-time) payments. Refund – displays only refunds. 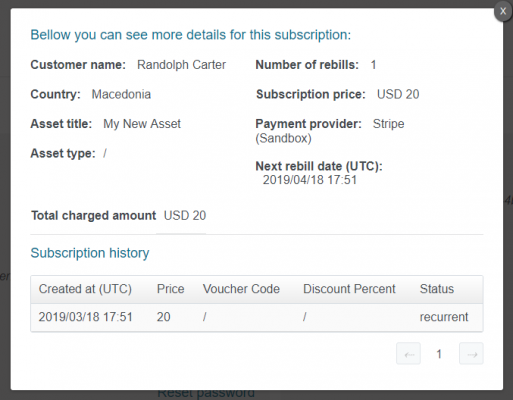 So, if you wanted to find the payment that was done by a customer with the email carter@mail.com, you’d click on the search field, type in customer email, press Enter, type in carter@mail.com, and press Enter again. Bellow that, you have the main part of the Payments tab, which is the table where you can see the details of the customer payments. The Subscriptions tab offers a complete overview of your customers’ subscriptions. Below that, you have the search bar, along with the option to choose whether to view a list of All, Recurrent, Canceled, Free Trial or Ended subscriptions. 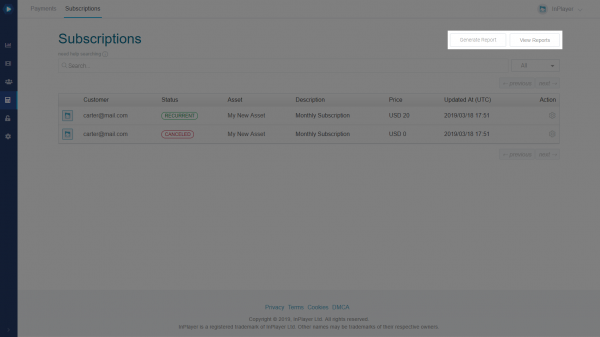 Recurrent – displays only active subscriptions. Canceled – displays only canceled subscriptions. Free trial – displays subscription still under free trial. Ended – displays subscriptions that were ended by the system due to some issue with the customer’s payment. So, if you wanted to find a subscription that was purchased by a customer with the email carter@mail.com, you’d click on the search field, type in customer email, press Enter, type in carter@mail.com, and press Enter again. 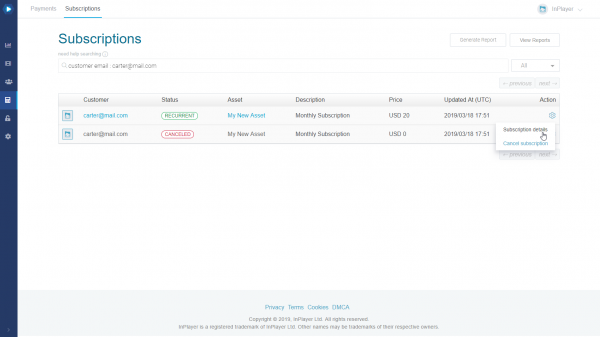 Bellow that, you have the main part of the Subscriptions tab, which is the table where you can see the details of the customers’ subscriptions. 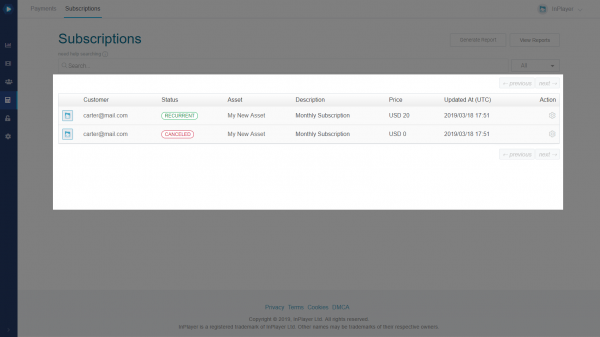 In the Subscription tab you can also cancel a customer’s subscription as well as view their subscription details. To do this, click on the button under the Action column in the customer’s row.